You are at:Home»Herbs»Cinnamomum camphora T. Nees. Latin name : Cinnamomum camphora T. Nees. Description : The gum resin is antiseptic, analgesic, carcinogenic, stimulant, antispasmodic, antirheumatic, diaphoretic, emollient and rubefacient. It is used in medicine internally for its calming influence in hysteria, nervousness and neuralgia, and for serious diarrhoea and for clearing mucous from the upper respiratory tract. It stimulates CNS-function and is an effective counter to barbiturate or morphine respiratory depression. Camphor is most commonly used externally mixed with oil as a counterirritant in rheumatism, sprains, arthritis, gout, neuralgia and back pain. It may also be applied to such skin problems as cold sores and chilblains and as a chest rub for bronchitis and other chest infections. It is often used in steam vapourisors to help control coughs by producing a local anesthetic action to the throat and to loosen congestion due to colds. When a cream or ointment containing camphor is rubbed onto the chest, throat, or back, body heat helps release camphor vapours that, when inhaled, help loosen mucus and relieve airway congestion. Recommended Dosage : 30 mg to 300 mg crystal powder. Contraindication : Camphor in large doses is toxic (2 g). The lethal dosage for children is approximately 1 g and for adults 20 g. Toxicity symptoms are headache, nausea, excitement, confusion and delirium; ultimately there is loss of consiousness. 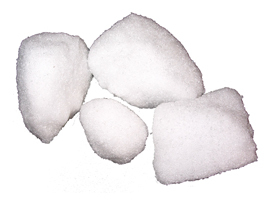 The ingestion of solid camphor by children is a common cause of camphor poisoning. Undiluted essential oil in their purest state is extremely potent, and should be blended with a carrier oil or other medium prior to use directly on the skin, as the essential oil may cause irritation. Camphor preparations should not be used in the facial regions of infants and small children, especially in the nasal area.